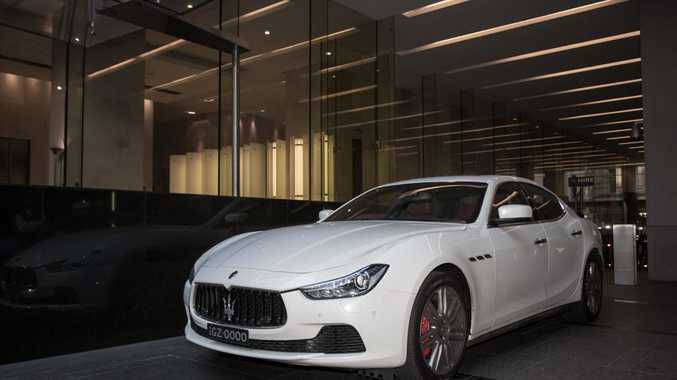 The new Maserati Ghibli S.
THIS week I will be featuring this beautiful new 2014 Maserati Ghibli S.
The Ghibli is known as the baby Maserati, as it's their cheapest and least powerful model they currently plan to offer, and for the moment it's only available with a six-cylinder engine. Even so, it is twin-turbocharged to produce a mighty 301kW (404 hp) at 5500rpm and 550Nm of torque (406 lb-ft of torque) from 1750-5000rpm. This is quite impressive from a 3.0-litre engine. Drive is then sent to the rear wheels only via a new generation eight-speed ZF automatic transmission, which is apparently brilliant. From owners that I have spoken to, they all say this gearbox is astounding, and that even in automatic mode it shifts exactly when you want it to. The Ghibli still features shifting paddles behind the steering wheel for if you want to manually control the transmission. This Maserati is able to launch from 0-100 kilometres per hour in just 5.0 seconds flat, and it will keep accelerating until it reaches its top speed of 285 kilometres per hour (177 miles per hour). Both the 550i and Ghibli accelerate from a standstill to 100 kilometres per hour in the same time, but the BMW is electronically limited to 250 kilometres per hour (155 miles per hour). Some other features that this particular Maserati is equipped with includes 20-inch 14-spoke 'Urano' alloy wheels wrapped in performance tyres, a power sunroof, Bianco paint, double-wishbone front suspension and multi-link rear suspension, a front and rear stabilizer bar, four-wheel ABS as well as traction and stability control, a post-collision safety system, electronic brake force distribution, self-levelling xenon headlights, daytime running LEDs, a Rosso leather interior, and much more. The Ghibli range is known to be the cheapest new Maserati you can buy today, and this S-model starts at just $169,900 plus on-road costs. Compared with the BMW 550i, the Maserati is about $10K cheaper, and in the long run, would you rather say you had a Maserati or a BMW in your garage?